We're officially jealous of Harper Beckham. See what happened when the little one and her dad took on the KissCam. 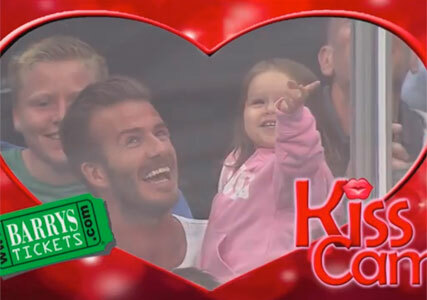 David Beckham has made our hearts melt in a brand new video which shows him giving his tiny daughter a peck on the cheek for the KissCam at an hockey game in LA. The footballer can be seen sitting with Harper, who turns two in July, when KissCam lens lands directly on the pair. David gestures to Harper to look at the screen and in her adorable pink hoody, she turns around and grins for the cameras. David then kisses his daughter, which result in fits of giggles, and a chorus of ‘aahs’. The star and his family were attending a game between the LA Kings and San Jose Sharks on Tuesday night when the KissCam captured the super-cute father-daughter moment. Victoria looked on proudly, while Brooklyn, Romeo and Cruz laughed from the front row, with an equally as smitten Tom Cruise and his son Connor. So not only did Harper get her moment in the spotlight, she also got to hang out with Hollywood’s finest. Not jealous at all… Check out the video below!